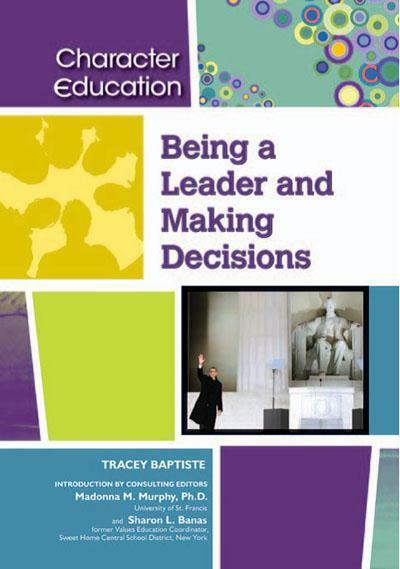 Tracey Baptiste, "Being a Leader and Making Decisions"
Most communities and organizations require an organizer to be successful and create change. "Being a Leader and Making Decisions" tells the stories of great leaders - why they led, how they gained support and became leaders, and why people followed them. Through historical and modern examples, readers will learn about both positive and negative traits of leaders and find suggestions about how to take the lead in their own lives and communities. History and current events topics covered include: leadership stories involving Mother Teresa, Gandhi, Alexander the Great, Joan of Arc, Queen Elizabeth I, Maria Montessori, Abraham Lincoln, and King Jigme Singye Wangchuk, who became king of Bhutan at the age of 16; stories of difficult decisions made by Louis Pasteur, Dr. Seuss, and Ludwig van Beethoven; and, profiles in successful and unsuccessful corporate leadership, including tales from Google and Enron. Being a Leader and Making Decisions Fast Download via Rapidshare Hotfile Fileserve Filesonic Megaupload, Being a Leader and Making Decisions Torrents and Emule Download or anything related.